Happy New Year! Welcome to 2019 everyone, we hope you had a safe and fun New Years Eve. The regulated cannabis industry just turned one year old today and oh what a first year it was. It was filled with ever-changing regulations, cities & counties constantly playing catch-up (before they even knew what they were doing to begin with) and of course, last minute deadlines with little to no forewarning. And the latter is what this blog post is all about. As some of you may know, the three agencies can no longer issue temporary licenses in 2019. This is why they came out with memos urging folks to apply for their temporary licenses by December 1, 2018. BCC never, formally, made this announcement but Lori Ajax, was heard offering this advice to audience members at certain speaking events. While some warning is better than none, it seemed to be a Herculean task for these agencies to process so many applications in only 30 days. You would think most businesses probably applied long before any memo of a deadline was around. But let’s face it, many cities/counties were still figuring things out and weren’t prepared to issue authorization quite yet. However, after reviewing how many temporary licenses have been as of today it appears this deadline set the regulated world on fire. 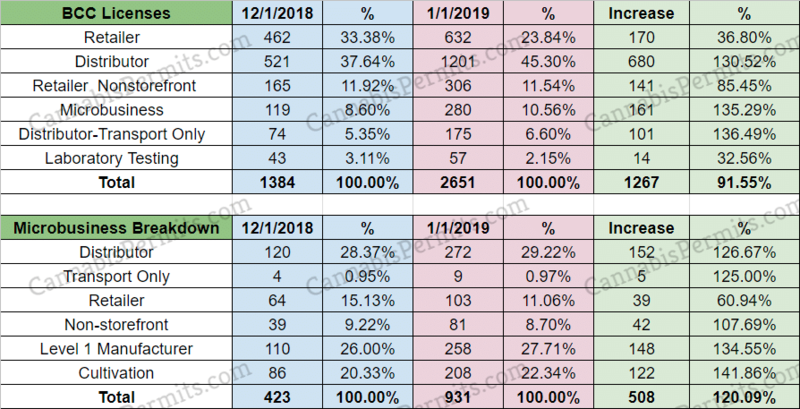 Below we have broken down the number of licenses and compared them from 12/1/2018 to today (1/1/2019). The increase is pretty staggering and gives you an idea of how many applications the licensing agencies had to shuffle through. No wonder they we’re working around the clock, time will tell if they got through them all or not. As you can see, the amount of cultivation licenses increased by 111% within just one month. We added a potential 853 acres of canopy which equates to just over 37 million sq ft. That’s a lot of weed. Given that temporary licenses are only good for 120 days, time will tell how many of these temp licenses fall off within the next 4-7 months. Some of our clients who applied for annual licensing received not one but two extensions on their cultivation licenses which gave them a total of 6 months before their temp expires. A colleague of of ours shared some interesting details with a popular Facebook group today about these cultivation licenses. 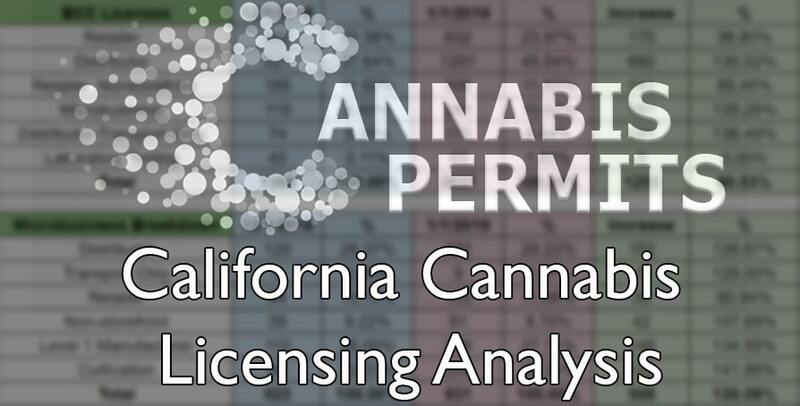 Kieran Ringgenberg stated, “Eight companies had more than 50 temporary licenses granted in December, all of those in Santa Barbara County. Two companies have more than 200 total licenses: Mesh Ventures affiliate Coyote Hills Agricultural Enterprise and The Vertical Companies-affiliate Iron Angel II each have 209 licenses, nearly all outdoor types.” It will be interesting to see how things shake out in Santa Barbara County. We wonder how many of those temps end up producing cannabis (or not). The cannabis manufacturing licenses had much more of a modest increase with only 29.55%. In most cases manufacturing is much more scrutinized by local jurisdictions which makes obtaining local authorization more difficult (and timely). The biggest takeaway we took from this chart is some folks have finally been approved for the Type-S license. This is the shared manufacturing license which we expect to see much more of in 2019. Right off the bat, seeing a 130% increase in distributors is pretty crazy at first. However, once you consider many of those are likely retailers, cultivators & manufacturers getting the license-type for themselves, it makes more sense. One thing we were happy to see was the number of retailers increasing. Our cultivation production desperately needs more retail outlets to legally sell their products. As of today we have 1,122 retailers when you combine storefront, non-storefront and micro-businesses. Considering WeedMaps.com has roughly 6,000 listings for retailers (mostly unlicensed), it is refreshing to see the legal market expand. It’s important to note that just because the numbers show 1,122 retailers it doesn’t mean there’s that many operating today. We suspect many made a last minute rush to get their temps but may not be operational. Many of them likely still have construction and/or local permitting to get through. Likewise, the testing labs are in a similar boat. We’ve heard that only 14 out of those 57 are prepared for Phase 3 testing which is required for anything produced after December 31, 2018. As we begin 2019, we finally have a set of permanent regulations to follow and thousands of licensed entities. That doesn’t quite mean that everything is set in stone, but at the very least we have a much better idea of what we’re working with now.